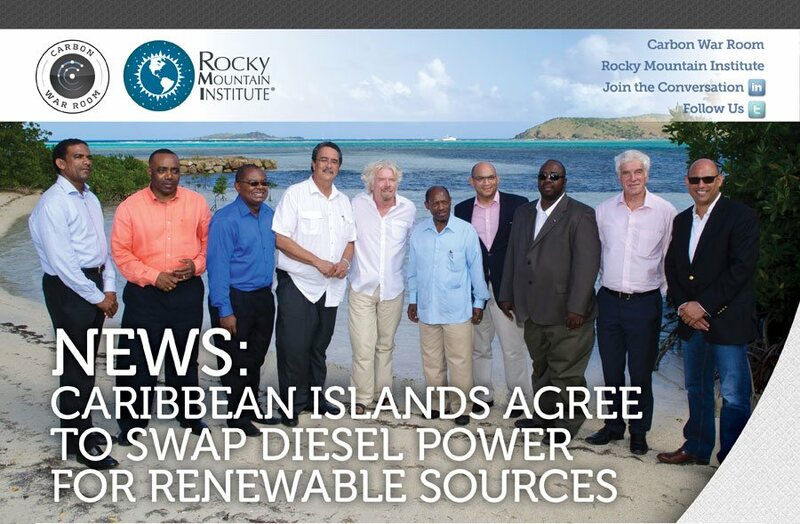 Brought together on Sir Richard Branson's Caribbean island retreat by the Carbon War Room and Rocky Mountain Institute, to work out a framework to effect a transition away from fossil fuels, six Caribbean island nations have agreed to replace diesel-fueled power with a mix of clean, sustainable renewable power generation, energy storage systems, and greater energy efficiency. The founder of both the Virgin Group and Carbon War Room, Branson is spearheading the “Ten Island Renewable Challenge,” an initiative that aims to promote and foster renewable energy development, enhance climate change resiliency, and support entrepreneurs and local businesses across the Caribbean Basin. “Islands are a microcosm of larger energy systems around the world and offer an excellent test bed to demonstrate and scale innovative clean energy solutions,” Rocky Mountain Institute co-founder and chief scientist Amory Lovins stated. Island nations are on the front lines when it comes to global warming, as sea levels rise and threaten sparse freshwater resources and stronger storm surges raise the threat of inundation and loss of life and property. Typically reliant on imports of diesel and fossil fuels, island nations can also boast some of the highest energy prices in the world. Looking on the bright side, island nations typically have a lot going for them when it comes to renewable energy potential, as well as the wherewithal to adapt and develop modern ways of life that are sustainable ecologically and socially, as well as economically. Joining with the Rocky Mountain Institute, Carbon War Room this past week hosted a congress of Caribbean island nation leaders at Sir Richard's Necker Island retreat. While there, governments of six Caribbean islands – the British Virgin Islands, Colombia (of which the Caribbean island of San Andres is a part), Dominica, Saint Kitts and Nevis, Saint Lucia, and Turks and Caicos – agreed to join the Carbon War Room's Ten Island Renewable Challenge. Launched in 2012 during Rio+20, the UN Conference on Sustainable Development, Branson and Virgin Limited Edition gave the Ten Island Renewable Challenge a big boost earlier this month when it announced it was partnering with NRG, one of the largest power companies in the U.S., to power Necker almost entirely from renewable energy resources. Virgin Limited Edition and NRG signed a Diesel Reduction Agreement that calls for the latter to develop a renewable energy microgrid for Necker that would meet at least 75 percent of the island retreat's power needs. It's envisioned that the clean energy microgrid will employ a mix of wind and solar energy generation along with smart energy storage systems. The Ten Island Renewable Challenge is part-and-parcel of a broader Carbon War Room initiative: Operation Smart Island Economies, the aim of which is to effect a transition to a 100 percent renewable energy infrastructure. Codification of standardized efficiency "playbooks" for hospitals and hotels to ensure all sites have access to proven energy solutions. In addition, more than $300 million in capital was raised to support renewable energy and energy efficiency projects for hotels, hospitals, schools and utilities.